Located north of Libreville and covering an initial area of 10,200 hectares, the Mondah Forest has lost 36% of its area since it was classified as a no-harvest zone in 1951. The decline in the area of the Arboretum Raponda Walker (named after the first Gabonese botanist) is due to human action. The forest is under strong urban pressure, which takes it in a vice between Cap Estérias in the north and Libreville in the south; the exploitation of sand quarries, and the extension of agricultural plantations are also the results of the situation, without considering hunting and gathering which are at the origin of the disappearance of many plants and animals species. However, the forest is still very rich in terms of biodiversity. One can discover Palisota (an endemic plant, editor’s note) or Okoumé (a giant tree which can reach more than 50 years of age and measure more than 60 metres) and Aleppo; a large tree, which is part of the dominant stage of the African forest, and which undoubtedly gave its name to the “Bois des Géants “. If it gradually disappears under the influence of man, it is paradoxically thanks to him that a solution is emerging today. The authorities have called on Biotope, a French company very involved in the preservation and study of biodiversity in the world, to launch an ambitious project, “the design and construction of the discovery trail of the Bois des Géants” whose objective is to make this protected area attractive for visitors. 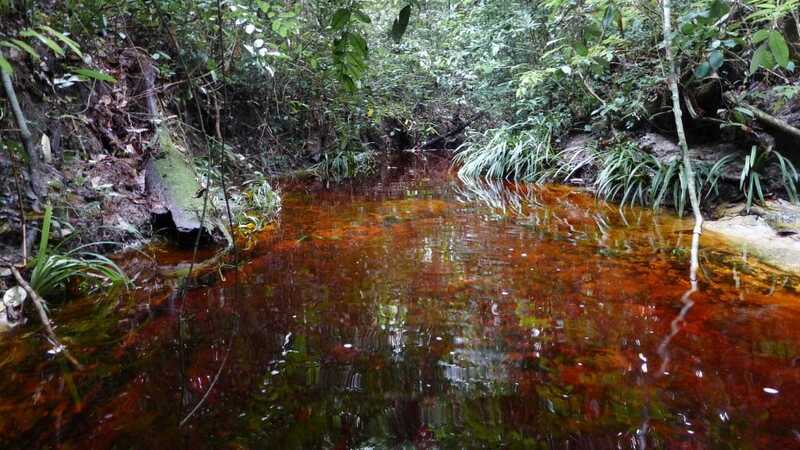 It is a matter of making the population want to protect this coastal forest by allowing them to discover and become aware of its beauty as well as its astonishing richness, to make it one of the first attractions for tourists passing through Gabon. 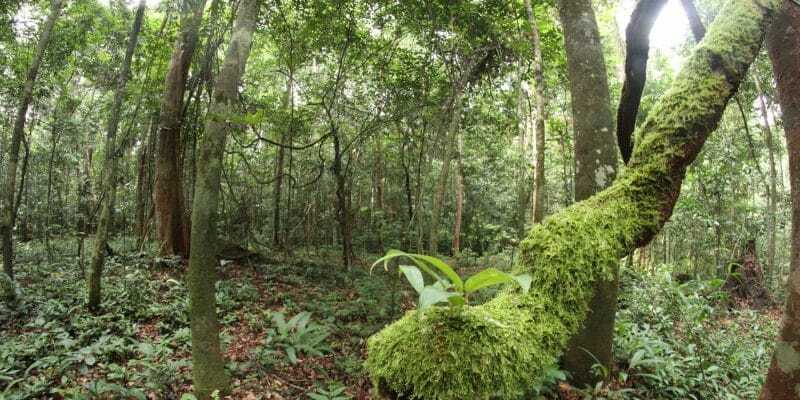 At the origin of the “Bois des Géants” project, there is the “Arc d’Emeraude” program, financed within the framework of the debt conversion agreement established between Gabon and France via the French Development Agency (AFD). The agreement was signed on the 29th of January 2008 for an amount of more than 32.8 billion CFA francs (£50 million), and had the particularity of being reserved for financing “projects contributing to the sustainable management of Gabon’s forest ecosystems”. According to Julien Cordier, Director of Biotope Africa, the “Bois des Géants” project is resolutely oriented towards a dual objective, both educational for the younger generations and targets environmental awareness for the general public. It will probably be the largest forest education centre on the continent, in the heart of Africa’s last great forest basin. In concrete terms, Biotope, whose expertise has been sought here, will build a 1.4 km trail. The design of its panels and discovery tools has been completed, as well as the architecture of the trail created by Crésolus, Biotope’s partner. The future construction site is currently under preparation, with the support of a second partner on the project: Island Planning Corporation. The trail will be extended by a canopy path that will also allow visitors to discover the forest from the treetops. An original way to make them aware of the protection of the exceptional biodiversity of this forest, by shifting their gaze to stir up new emotions in relation with the beauty of large trees. “The primary targets are students and teachers in Libreville schools, who will be able to teach in the trees, as a continuation of the awareness initiatives already implemented today by local associations,” says Julien Cordier. Biotope, which has 25 years of experience in accompanying ecological development projects, has designed a highly integrated slatted path, which will wind through the forest, linking 16 thematic stations equipped with interpretation panels and interactive supports. They will make this visit a funny, educational and multi-sensory experience, allowing visitors to discover the Gabonese forest and learn to better observe its fauna and flora. The project manager, Biotope, is a company specialised in taking into account ecology and the environmental approach of development projects. It has several activities: environmental engineering and consulting, innovation and research, communication and publishing. It is this original combination of professions, as well as the quality of its references, which enabled it to win the international call for tenders for this mission. In addition, the company opened its Biotope Central Africa branch in Gabon a few months ago and thus became Gabonese. It is worth mentioning that this is not her first project in this Central African country. In 2013, Biotope analysed an ecological impact study file for a mining project in Gabon. In the years that followed, the company regularly conducted “consulting, training and expertise missions across the country for clients in the public and private sectors,” as Julien Cordier points out. With 236 employees, mainly engineers, it has a strong presence in France and elsewhere in the world. With always the same philosophy: the local recruitment of its executives and its teams; an approach that is a guarantee of territorial integration that produces meaning at all levels. This is also the case in China, where Biotope works with public authorities, private companies and international donors, such as the French Development Agency and the Asian Development Bank. In Morocco, the company is also present through its local subsidiary known in French as Biotope Ingénierie Biodiversité (BIB). In the Cherifian kingdom, it is highly involved in the impact study related to the production of green energy. This is also the case in Madagascar with Biotope Mada. On the big island, the company also works to preserve local biodiversity, a flagship concept around which all the her activities revolve. Through its Gabonese establishment, Biotope now hopes to extend its activities to all Central African countries.